NS carried out a market analysis for the future of rail transport in, to and from Zeeland. To give some preliminary insights into possible scenarios for the future, three alternatives were explored in broad terms. A social impact analysis was performed for these alternatives, which provided additional insights. Current situation: there are two Intercity trains an hour that stop at all stations between Vlissingen and Bergen op Zoom. Alternative 1 - extra Sprinter trains: the Intercity service is faster and trains no longer stop at stations between Goes and Bergen op Zoom. We serve those four stations by putting on two extra Sprinters per hour that run between Goes and Roosendaal. Alternative 2 - extra Intercity trains in peak hours: one additional fast Intercity to Amsterdam in the morning rush hour and one extra to Vlissingen in the evening rush hour; in Zeeland, the train only stops in Vlissingen, Middelburg and Goes. Alternative 3 - using buses: the Intercity service is faster and only stops in Vlissingen, Middelburg and Goes, while the stations in between are served by a new fast bus service (twice an hour). 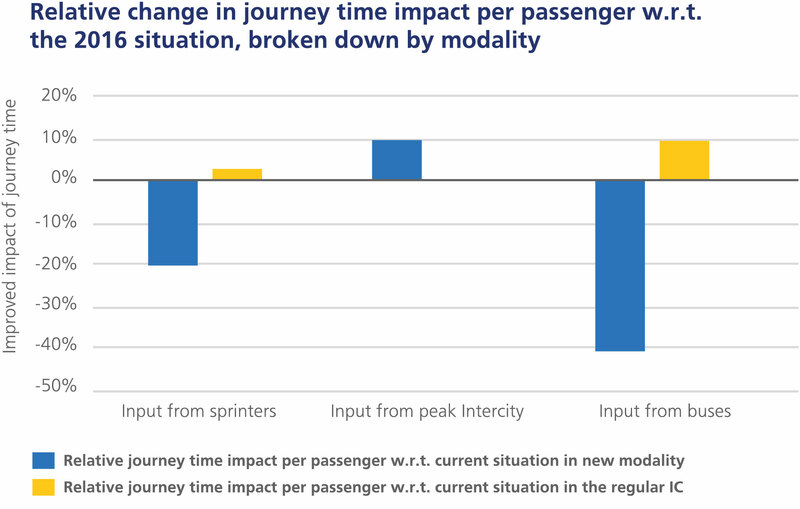 The social impact aspects we quantified were mobility, journey time (subdivided into time on transport, waiting time and changeover time), emissions, noise and safety. All three alternatives add social value compared with the current timetable. 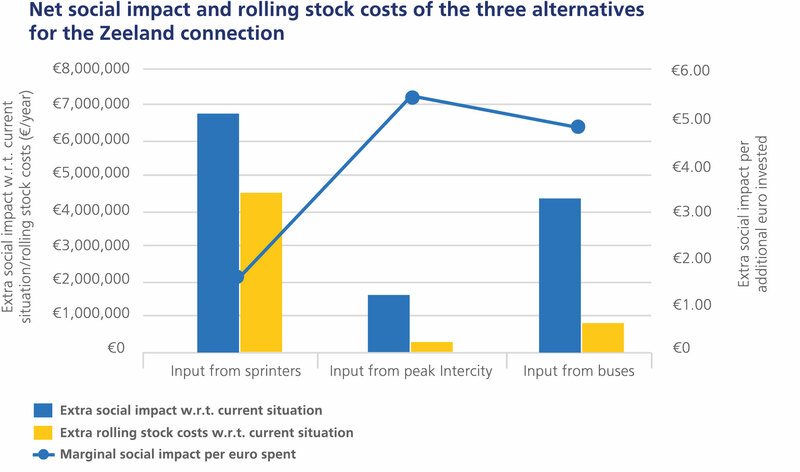 The alternative with the greatest social impact is the option in which Sprinter trains are used as that results in the greatest potential increase in passenger numbers. In this case study, we also examined the social effectiveness of investments and the impact on journey times for different categories of passenger. There are also differences between the alternatives in the impact on emissions, noise and safety, but these effects are negligible compared with the other aspects. A different picture is obtained when the journey time per passenger is considered. In that case, the alternative with extra Intercity trains in peak hours has the most positive impact compared with the current situation, because the journey time improves twice a day without any deterioration during the rest of the day. That will also be the case for some passengers for the alternatives involving additional Sprinters or buses. We also calculated the social impact using the expected investment costs per alternative. This gives the rush-hour Intercity trains as the most effective solution. That alternative delivers the most impact per euro invested. The social impact analysis for the different alternatives in Zeeland has given a better understanding of which alternatives are promising in terms of both social and financial returns on investment. The outcomes of this case study gave different options for social impact, which NS used in decision-making and in talks with stakeholders. NS intends introducing the fast rush-hour Intercity trains in Zeeland with effect from December 2017.